A window that provides some basic features needed for all apps Use this class only if you need a custom content for your application, different from the Page Row behavior recommended by the HIG and provided by ApplicationWindow. Definition at line 78 of file AbstractApplicationWindow.qml. contextDrawer: OverlayDrawer The drawer for context-dependent actions, that will be opened by sliding from the right screen edge or by dragging the ActionButton to the left. When this page will be the current one, the context drawer will visualize contextualActions defined as property in that page. Definition at line 192 of file AbstractApplicationWindow.qml. header: ApplicationHeader An item that can be used as a title for the application. To achieve a titlebar that stays completely fixed just set the 3 sizes as the same //FIXME: this should become an actual ApplicationHeader controlsVisible: bool This property controls whether the standard chrome of the app, such as the Action button, the drawer handles and the application header should be visible or not. Definition at line 129 of file AbstractApplicationWindow.qml. globalDrawer: OverlayDrawer The drawer for global actions, that will be opened by sliding from the left screen edge or by dragging the ActionButton to the right. Definition at line 136 of file AbstractApplicationWindow.qml. Definition at line 87 of file AbstractApplicationWindow.qml. reachableMode: bool When true the application is in reachable mode for single hand use. the whole content of the application is moved down the screen to be reachable with the thumb. if wideScreen is true, or reachableModeEnabled is false, tis property has no effect. 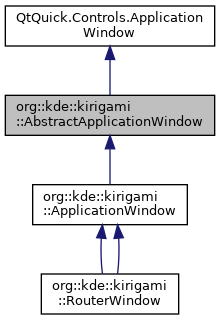 Definition at line 200 of file AbstractApplicationWindow.qml. When true the application will go into reachable mode on pull down. Definition at line 204 of file AbstractApplicationWindow.qml. wideScreen: bool If true the application is considered to be in "widescreen" mode, such as on desktops or horizontal tablets. Definition at line 142 of file AbstractApplicationWindow.qml. a pointer to this application window can be used anywhere in the application. Hide the passive notification, if any is shown. Shows a little passive notification at the bottom of the app window lasting for few seconds, with an optional action button. message The text message to be shown to the user. actionText Text in the action button, if any.